I don’t remember what triggered it now. There was something, though. Some little, probably-completely-insignificant thing that sent me through the roof. I’d just HAD IT with whateveritwas. Ohhhhh, I think I remember now! It had to do with a child showing signs of entitlement. Or laziness. Or both. There are times, children, when “Yes, ma’am, right away!” is the ONLY proper answer to your mother’s request that you wash dishes. Some kid didn’t do some chore they were asked to do the night before, and then it pushed things back and had a major impact on my morning the next day. It felt a lot bigger than it was. I can see that now. And I wasn’t rejoicing in the many times my kids DO listen. But still, it was a symptom of a problem that’s been ongoing, and that problem really was bigger than its symptom — so it was kind of a justified explosion of frustration going on in my head. I want them to listen. They just don’t get it. What I’m doing hasn’t been working! ARGH, there HAS TO be another way to do this that doesn’t involve corporal punishment. Really: I want my kids to respect me and be hard working little minions, dagnabbit!!!!! Out of that frustration was born desperation for change. Not even hoping for change, guys, this went deep. is pretty much epic-prayer-level communication with God. My kids have been informed that they are doing 30 minutes of housework every day henceforth and forever with no rewards whatsoever other than satisfaction from a job well done, simply because they are living and breathing, amen. It was quite possibly the best idea I’ve ever had. There was some weeping and wailing and fit-throwing the first day, but I expected as much. They are, after all, children. The second day, though, they were resigned to their fate and BOOM, the magic started happening. I actually didn’t expect that part to kick in so soon, but maybe I should have. where the 10yo came down stairs first thing in the morning and started on the dishes. Without any fanfare or fuss or anything. …and, actually, without any breakfast yet either. “You can eat first if you want to, Buddy,” I compassionately told him. “NO. I am getting this DONE, Mom,” came the immediate reply. He had the satisfaction of being chore-free the rest of the day, and I had the singular experience of walking in my kitchen after eating breakfast and finding it cleaner than I left it, without having had to tell anyone to do anything — and (this part is especially nice) without having to say it more than once. You can’t buy that kind of happiness, people. I’m praising God for it now, because without it I don’t think I would have been open to seeing things differently. That happens a lot in life — We have to get pretty miserable before we’ll do what it takes to change… and then, when we do, often we find that life quickly gets a lot better. For years I’ve been pretty horrible at keeping track of the whole chores thing. I’ve tried, really, but I just seriously struggled with that whole housework thing. I wanted it to be fun, but I couldn’t keep track of it to save my life. I wanted it to be exciting in some way. Every time I’d hit almost-rock-bottom frustrated with the messy house thing, I’d come up with a new idea to try to romance them into going along with it. You all live, breathe, eat, wear clothes, walk around in and sleep in this house. You give me 30 minutes of focused housework every stinking day and it’s just part of normal life now. When you grow up, you’re going to spend about that long cleaning up after yourselves even when it’s just you, so this is just darn good parenting, that’s what it is. It’s also about freaking time! I should have done this a long time ago. 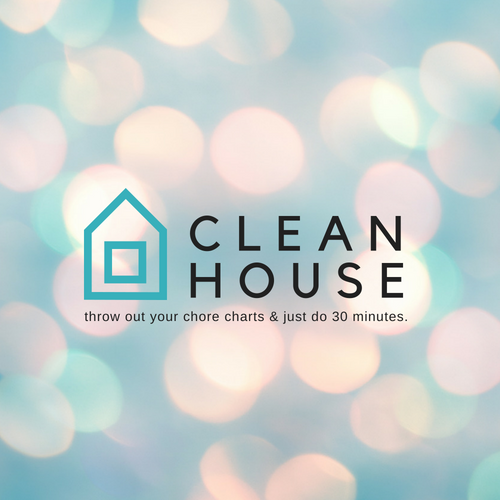 No chore charts. No games. No gimmicks. No rewards or points or bribes. They just do what I tell them to (or get approval if they figured something out on their own) and report back for new assignments if their 30 minutes aren’t up yet. No keeping track of who’s turn it is to do what. They use the stopwatch function on their cheap wristwatches, and ta-da! I don’t have to bother with it. It’s going to take a little while, but I’m reeeeeeeeally hoping that with all those kids pitching in like that, little by little, we’re going to be getting it cleaned up faster than we mess it up. Someday I’m going to have kids really searching to find something to fill 30 minutes with. I know it is, because desperation prayers can move mountains — even mountains of laundry. I can’t wait to watch these kids prove it.